After boldly crossing the street yesterday, I navigated my way back to the hotel and treated myself to a fancy dinner and a glass of wine. I wasn’t sure what was next on my agenda, so I got online (thank god for the internet) and started perusing options. Somewhere in the midst of links and pages, I saw something about “old Japan” just an hour out of Tokyo. It turns out some of the ancient Buddhas and shrines I so longed to see were safely ensconced in the small town of Kamakura. The train ride seemed easy enough, so I decided that would be my next adventure. 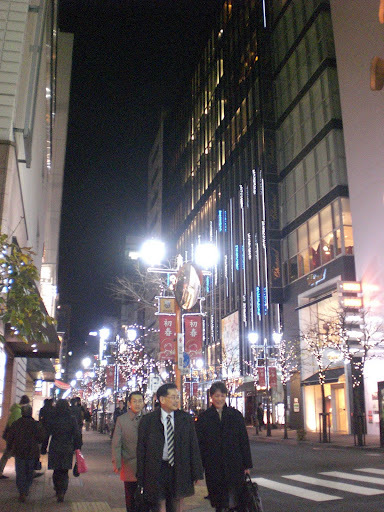 After all, if I could cross the street and make it back safely, why not just leave Tokyo altogether for a day? When I arrived on the platform for the train heading due south, I immediately noticed my new favorite toy – the “coffee vending machine.” While figuring out which type of coffee to buy and how much yen it might cost, a young boy with a cute Australian accent set about torturing his younger, stroller bound brother. I couldn’t help but giggle. The parents, with frustration, did their best to alleviate the sibling rivalry, and because strangers don’t outwardly acknowledge each other in such situations, I set about fiddling with my coffee and keeping my obvious amusement directed towards my feet. Eventually the parents apologized, to which I could only reply “Don’t worry, they’re brothers.” We began a conversation – where was I from, where were they from, etc, etc. It was such a relief to be engaged in an actual, verbal conversation. For three days I hadn’t really had a conversation. 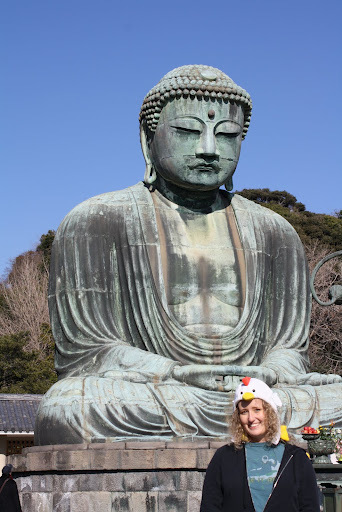 It turns out that Jon and Sara were on the same journey to Kamakura as I was – but they hadn’t really defined their plan. I shared what I had learned, and we decided to join forces for the day. Anyway, after a peaceful hour on the train, we arrived in Kamakura. We left the train, and after a brief moment of confusion, we found the train to the Hase, the town where the Giant Buddha sits imposingly meditating. Another brief ride on a train reminiscent of the San Francisco trolley cars and we found ourselves in an authentically historic neighborhood of Japan. The cobble streets were narrow and winding and the sidewalks were scarcely wide enough for a pair to walk side by side. We were all easily distracted by the abundance of little curio shops – we adults maybe even more excitable and distractible than the kids. 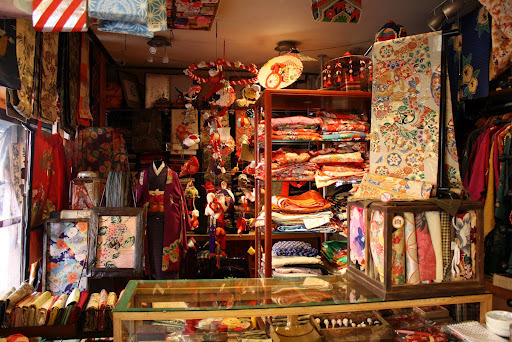 We stopped by a beautiful kimono shop where I was promptly scolded for taking pictures. I’m not totally sure why – it’s not as though I have any hope of EVER recreating any of it – but it was just so beautiful with its oranges, reds and yellows aflame and alive. We walked a short, crowded path to the Giant Buddha. All my life I have wanted to stand before one of these massive structures – and I can tell you that it was no dissappointment. I am not sure how to describe it; Adjectives just won’t do. There before me was a massive statue, perfect in its artistry. But that wasn’t the part that left an indelible mark on me; the feeling of standing before a landmark that has been there for nearly 1,000 years…that is the part I simply can’t describe. The buildings that orginally existed around it were destroyed by typhoons and tidal waves…yet this massive giant stood immovable. The moment was breathtaking. . . solemn. . . unmatchable. So I had the only reaction I could have – I stood silent, mesmerized, enthralled. And then I pulled out my chikin hat and had my new friends photograph me wearing the traveling hat, because life is short and ever-so-serious if you let it have its way, and this simply will not do. After the Buddha, the lot of us wandered back through Hase in search of the Hasedera, or the Hase Kannon Temple. Once again, I climbed my way to a breathtaking sight. 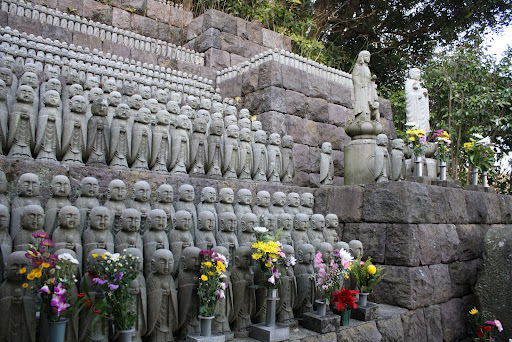 Surrounded by Jizo, I felt a sense of peace and was overwhelmed with awe. Thousands of tiny steps meandered past thousands of tiny buddhas, and I walked through them all. A journey like this forces a person to confront relgious beliefs. I haven’t questioned my beliefs for years, and I don’t now. But one thing I realized was that if I have an opportunity to say a prayer for my loved ones, I will. I want good energy flowing through and around my friends and family as often as possible, so with yen jingling in my pocket, I tossed a few coins, lit some incense, and said a prayer for those I love. I can only hope that the winding wisps of smoke traveled far enough for my prayers to be heard. Later, Jon and Sara treated me to a lovely Unagi dinner, after which we made our way back to Tokyo. We consulted our subway maps to figure out on which of the hundreds of stops we should disembark. 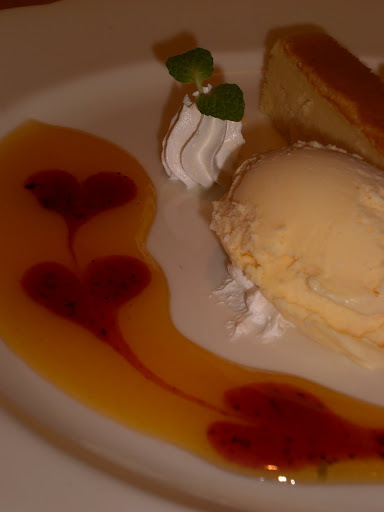 We all agreed that Tokyo Station would be the best bet…and probably it was. But what I failed to anticipate was exiting the subway station only to find myself in the dead center of the Ginza shopping district. Basically, in the space of 72 hours, I went from the comfort and guaranteed orientation of a 30 square mile island to being hopelessly lost in the heart of what I can only compare to 5th Avenue in New York City. Oh, did I mention it was after dark? I wandered, freezing, hopelessly lost, finding myself without a soul who spoke English to guide me. After wandering up and down the same streets several times with no luck or direction, I decided to take a chance on the only store I could find sporting an American flag. Luckily the sales clerk at the Tokyo Louis Vuitton spoke enough English to direct me to the Tokyo Metro. Exhausted and past my bedtime, I arrived safely at my hotel. excerpt from my journal: I can’t even explain how amazing this was. Towering, Imposing, Ancient, and yet Serene. How amazing to be standing in front of a statue that has been in National Geographic. Me. Cami. From Union. Of course, no one around me understood the significance…How did this happen? Is it wrong to be proud of my bravery? Maybe there’s nothing left for me to be scared of….